A native of Chicago, Illinois, Monaye Darke is a student at Howard University in Washington, DC and a contract winner of Model Productions. Monaye has received training under the leadership of Stacy Mathis at Murphy's Dance Studio (Albany, Georgia) in ballet, jazz, and tap since 2000. In 2004, she performed as a ballet dancer in a production of "Snow White" for Ballet Theatre South. In the summer of 2005, she attended Beverly Arts Center (Chicago, IL) and performed as a dancer in "Once on this Island." At age twelve, Monaye was challenged to expand her dance repertoire and began receiving additional training at Fuzionz Dance Studio (Albany, Georgia) in Hip Hop dance. Under the tutelage of Roger Howard and Sabree Johnson, Monaye developed rapidly. Since age twelve, she has been the youngest member of the Fuzionz Competition Team that consists principally of college students. This competition team has traveled to throughout the U.S., competing as a group and individually. 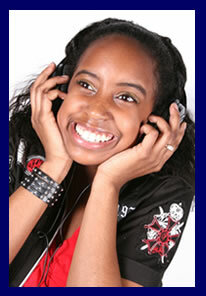 In addition to Monaye receiving several group achievements, she was a recipient of the 2006-2007 Dancers Rock Star Award in Dallas, Texas and the 2009 Monsters of Hip Hop Scholarship to travel to Hollywood, California. Additionally, Monaye has traveled to attend workshops for supplementary training in hip hop from renowned choreographers Napoleon and Tabitha Dumo, Tony Testa, Rhapsody, Jamal Sims, and Dave Scott. In June 2009, in addition to her local training in ballet, jazz, and tap, Monaye attended a dance intensive workshop at Florida State University (Tallahassee, Florida), where she was challenged by Sheila Humphreys, Rebecca Lee, Lynda Davis, Tim Glenn, and Tom Walsh to move beyond her previously defined range.